Make un Unforgettable Surprise for Dad! 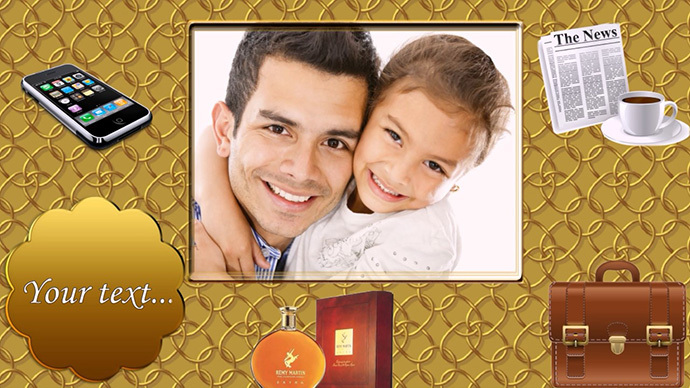 Father's Day is getting closer and closer with each week, and now it is high time to choose the best gift for your dad. If you are tired of meaningless store-bought presents, think about making a touching surprise. A photo slideshow for Father's Day is a perfect idea. Your dad will certainly appreciate such a gift because it will be personal and moving. A big advantage is that you can either play it at the family gathering or send it by e-mail if you live far away from home and won't make it to the party. Want to see an inspirational example? Then, click Play and enjoy the video below! This energetic picture slideshow, created with SmartSHOW 3D software, is full of fun animation effects, and the slide designs feature all kinds of things that real men love: fast cars, smart gadgets, and stylish business accessories. 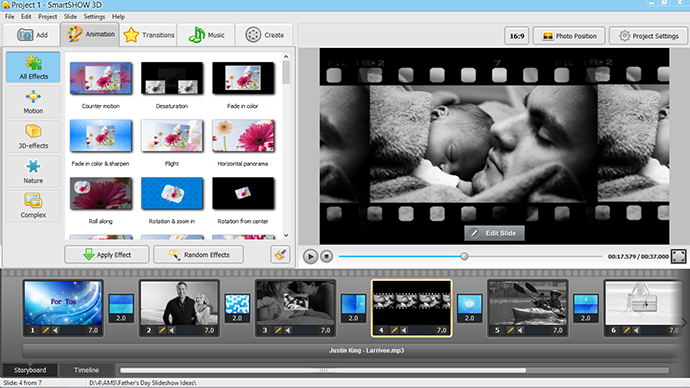 You do not have to be a pro to create a slideshow - it is absolutely easy to make one. With SmartSHOW 3D video slideshow maker, you can create a terrific photo movie with special effects, animated collages and 3D transitions. 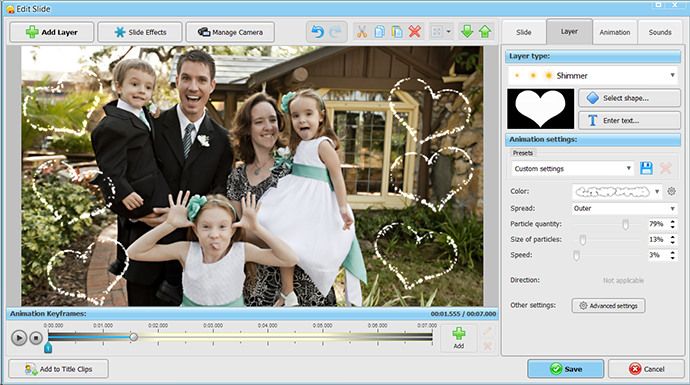 This software also allows you to use captions and microphone recordings, so you can add a personalized greeting or a voice message to your slideshow. Read on to find out more on slideshow making techniques, and get suggestions on using quotes and songs! Running out of time? No problem, the "Slideshow in 5 Minutes" option will help you out. It offers ready-to-use templates - you only need to choose the style. Vintage and black & white slideshow ideas look great both with group family photos and with portraits. If you do not have enough images for your Father's Day slideshow, you can take your dad's old photos and scan them. Do not forget to select his favorite song as a soundtrack - it will surely add some important dimension to the slideshow. Turn his life story into a digital flow of memories! 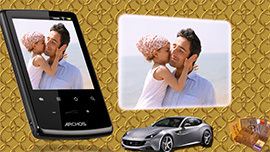 Devote some more time and create a photo slideshow slide by slide to emphasize your dad's role in your life and give him a genuinely heartwarming gift. Use scanned and digital photos, and try to find some pictures that show him having fun with your family. 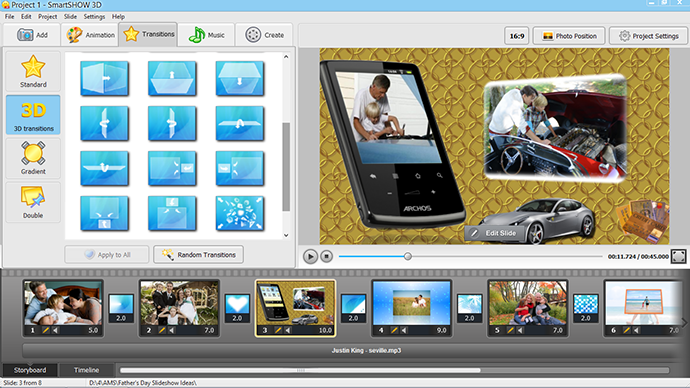 Add the photos and a song, try applying animation effects and select the best-looking transitions. If he is keen on modern design, check out Father's Day slideshow templates, created particularly for men's birthdays, holidays and other occasions. 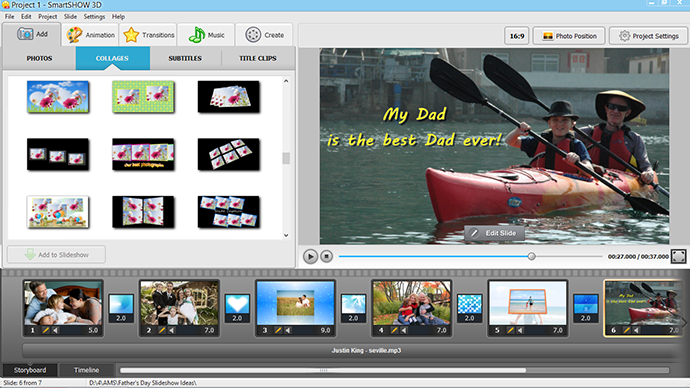 You can also learn how to make a video collage to make your Father's Day slideshow even more spectacular. Use your microphone to record some comments and put them right into the slideshow. Ask your mom, brothers and sisters to participate in the fun! A great plus of making a Father's Day slideshow yourself is that you rediscover your dad’s past and get to know more about this fascinating and inspiring man. A photo story of his life adventures will surely become one of his favorite movies. Create the best gift for the one who made you the person you are now!